My daughter is in her second year attending Stone School Cooperative Nursery and we absolutely love the school, the teachers, and the other families. I strongly recommend the school. The school offers four classes: 3s on Tuesday and Thursday morning, 3/4s on Tuesday and Thursday afternoon, 4s on Monday, Wednesday, and Friday morning, and PreK on Monday, Wednesday, and Friday afternoons. My daughter attended the 3/4s last year and is in PreK this year. The afternoon classes worked perfectly for our family as my daughter and I are not morning people. I am the type that wants to be involved in her school so a cooperative has worked well for us. I love spending time in her class and knowing her classmates and seeing how the class operates. I assist in the classroom once or twice each month and have also been a member of the board. This involvement has allowed me to develop relationships with many of the other parents at the school. The school is not just a place where you drop your child, it involves the whole family. The school goes out of its way to plan out of school activities with weekly play dates in the summer, a family picnic before school starts, the Ann Arbor Fourth of July parade, class play dates through the year, a class potluck at school, and parent coffees during class. I love asking my daughter where did you learn that and to hear her say “I learned it at school” or “My teacher taught me”. She is very proud of her school. Every morning she eagerly asks if this is a school day. She has loved both teachers. Both teachers have been at Stone School since 1989 bringing experience with a wide variety of children and situations as well as providing the cooperative with a sense of continuity. The building is part of what we love about the school. 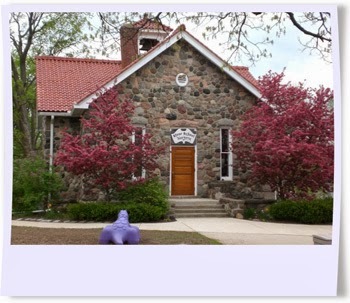 Stone School was built in 1911 and is listed on the National Historic Register. The Cooperative, which started in the building in 1955, purchased the building in 1995. The classroom is light and airy with high ceilings and lots of windows. There is also a wonderful basement which provides an area for large motor play with a rope ladder, rings, ride-on cars, a puppet show, and play structure. This is easily my daughter’s favorite part of the school. See the School’s Facebook Page for some great photographs of the school. Come visit Stone School Cooperative at our Open House from 10a-noon on Saturday, February 12. Open enrollment begins at the open house. Disclaimer: This post was written by me, the blog owner. My daughter attends Stone School Cooperative Nursery and as I mentioned, I am a board member. However, this blog is not affiliated with Stone School Cooperative Nursery or any of the other recommended preschools. If you would like to recommend your child’s preschool, you may submit an article to me at aapreschoolevents@gmail.com based on this request.